• Don't eat chips, nuts or crunchy food items 2 hours before singing as it can lodge in the throat. • Don't consume cream, ice-cream or cheese 2 hours before singing as it can block the throat. • Do drink plenty of room temperature water 2 hours before singing to lubricate the throat. What should I do before I begin to sing? • Clear all passages such as nasal, throat, bladder and bowels. • Use a throat gargle such as Betadine (throat iodine) regularly each week. A throat gargle will clear any congested throat areas. I find Listerine too strong and don’t recommend it; if you must use a supermarket variety and dilute it well. Check with the manufacturer if you have any doubts or questions about the product’s drying effects on a singer’s voice. • Drink a glass of room temperature water or a lukewarm fruit tea to lubricate the throat before you commence singing. Drinks should never be sparkling, hot or with ice. • Do slow shoulder rolls making sure the elbows are slightly bent and resting beside your hips. Do gentle body stretches with knees slightly bent, bending gently without force. • Check that you are not in a draught or near a fan as this can affect your throat and health during and after singing practice. 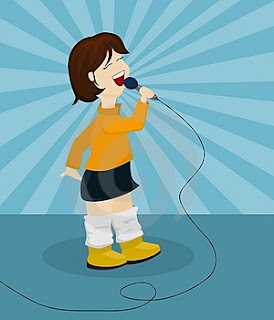 • Check you have all necessary sheet music, lyrics and equipment organised, check your backing recording is on the correct track (song) and your microphone and song are at the correct volume levels before you commence singing. • Take a moment to focus on your song; remind yourself where any difficult areas may be and how you should sing it (its personality, vocal changes or words). • Make sure you have good posture by resting your weight evenly on each leg; your back should be supported, not stiff and not leaning forward. To get correct posture, roll your shoulders up to your ears, and then lower them. • Prepare for the music to begin with your eyes in view of the lyrics or audience. Take your breath gently through the mouth allowing at least 3 counts (or beats) before the first word of the song to get a full breath. Don’t force air through your mouth cavity, draw it back gently and make sure your mouth has enough opening to get a clear entry without your teeth obstructing it.